Big trucks beget big names, and among the newest big boys right now is Nissan’s Titan. This truck was introduced in 2016 as the Titan XD to split the difference between half-ton (think Ford F-150 and Silverado and Ram 1500) and heavy-duty models (Ford F-250 and 2500 variants of the others). Nissan has expanded the Titan line for 2017 with the addition of true half-ton models. They may have lighter maximum payload and towing ratings — 732 kg and 4,268 kg respectively, when properly equipped — but these new half-ton Titans still own that big name. Like all modern pickups, the Titan really is massive, not just in measurement but visually. Initially, all of the 2017 models are Crew Cabs, meaning you get four full-size doors with rear-seat legroom to rival a full-size luxury sedan, and for now, you can only get your Titan with a standard bed. Likewise, all that’s available under the hood is a 5.6L gasoline V8; a Cummins diesel is reserved for the XD, and a less-powerful V6 option comes later, along with regular and King Cabs and, presumably, a choice of two or three bed lengths. Looking at the Titan on its own, you’d not guess this lighter-duty truck is more than a foot shorter in overall length than the XD, which rides on a different, more robust frame. The side steps and A-pillar grab handles are a necessity, particularly if you’re on the short side; it’s a real hike up and into the Titan’s cab. Once you’re in, the big, wide seats are comfortable, and there’s good space all around. But even with the driver’s seat’s height adjustment cranked all the way down, our view was compromised by a windshield header that felt low for such a large vehicle. We get a similar sensation in the Toyota Tacoma, and wonder if that’s some weird design quirk of Japanese pickups. In back, we like how the bottom seat cushions flip up easily, without the need to pull or release any handles. It’s only when you want to fold them back down that you must pull a lever on the bottom of the cushion. However, rear seat passengers complained about the lack of a height adjustment for the shoulder belt’s D-pillar anchor, which had the belt chafing their necks. Another demerit is a low and short bottom seat cushion that provides little thigh support. Another nice feature is a deployable cargo platform that provides a flat load surface when the seats are folded up out of the way. It proved handy by creating a small storage cubby that kept a couple of (sealed) beverage bottles from rolling around while we were driving. We appreciate the Titan’s simple secondary controls, but the stereo’s volume knob is a long reach from the front passenger seat, as is the tuning control for the driver. And the 7.0-inch infotainment touchscreen that houses navigation and some audio controls is smaller than what’s available elsewhere: Ford and Chevrolet, for example, put an eight-inch display in their trucks. Titan’s big gas V8 makes 390 hp and 394 lb-ft of torque, and those figures translate into impressive acceleration for a nearly 2,600-kg vehicle. Of course, that’s with a single person on board and nothing in the bed, but the impression is that even without the XD diesel’s huge 555 lb-ft, the Titan would stand up nicely to those tow and payload ratings. 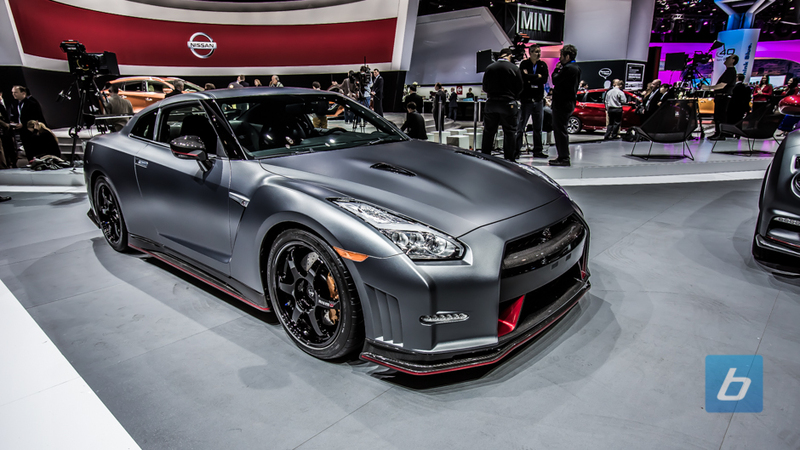 Nissan uses a seven-speed automatic transmission here, besting the class average by one ratio, but if numbers matter to you, GM offers an eight-speed in some versions of its Silverado and Sierra twins, and Ford is getting set to bolt a 10-speed into its F-150. A missing touch we would have appreciated is any kind of accommodation to ease the climb into the truck’s bed. There are no steps in the corners of the rear bumper and nothing as fancy as a stowable step-and-grab handle built into the tailgate. Our gearhead brains like the technical sophistication of the turbocharged engines going into many cars and even some trucks, like the Ford F-150. But no turbo V6 sounds quite like a V8; the Titan’s engine and exhaust notes aren’t particularly obnoxious, but accelerating in a hurry earns you an ear-pleasing rumble that graduates to a mild roar as the revs climb. Smaller turbo motors like Ford’s EcoBoost V6s don’t sound like V8s, and if you believe Natural Resources Canada’s fuel consumption estimates, they’re more efficient, too. The 3.5-litre EcoBoost V6 makes a bit less horsepower and a lot more torque than the Titan’s V8, but is rated for 13.6/10.2 L/100 km (city/highway) in an F-150 4×4, while the Titan’s ratings are 15.2/11.1 L/100 km and our tester returned an average of 12.0 L/100 km in highway driving. Titan is pleasant enough to drive around town, if you don’t mind the typical bounce generated by a rear suspension that feels happier with a lot of weight riding on it. The steering is heavier than in some other full-size trucks, making this truck a bit of a workout in parking lots and city driving. City or highway, watch your lane positioning: the Titan is not significantly wider than any its competitors from Ford, GM, Ram and Toyota, but it feels like it is. Maybe that’s a factor of the tow-friendly mirrors, which stick out much farther than the more car-like mirror housings on most pickups. You’ll want to be careful pulling up to toll plazas and drive-through windows so you don’t scrape anything up. A strong push folds them in against the door, which you’ll want to do as a courtesy to the drivers of neighbouring cars in tight parking lots. This truck is an imposing sight: we noticed numerous drivers actively change lanes to get out of the way, even when we weren’t fussed about them being in front of us. Depending on any insecurities you might have, that could be a nice ego-stroke. Our test truck was an SV Premium model, a $55,800 truck that, thanks to an optional Premium package, comes with passive keyless entry, navigation, automatic headlights, step rails, power-sliding rear window, heated front bucket seats with driver’s eight-way power adjustment and lumbar, backup camera, blind spot warning with rear cross traffic alert, bed-mounted 110-volt power outlet, trailer brake controller with trailer brake check function and manually extendable tow mirrors. That’s in addition to a list of more banal features that come standard in the basic $48,150 SV model. If you want something a little more straightforward, there’s the Crew Cab S model, at $44,650. 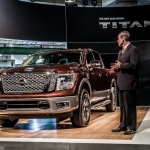 The original Titan didn’t have a significant impact on making Nissan the kind of household name in the full-size truck segment that Ford, GM and Dodge are. This new version has more of the little things that could make it more memorable, but it also lacks a handful of the thoughtful touches that make everyday living with a truck easier. But imposing looks and serious payload and towing abilities probably mean more to today’s truck buyers, and if we’re guessing right and that’s the case, this new Nissan Titan is ready for the big time. This post Review: 2017 Nissan Titan XD Pickup – Imposing Looks, Serious Payload appeared first on TractionLife.com by Chris Chase.